Fun-Casino is an interesting gambling site that opened its doors in 2014. With a platform provided by SoftSwiss, Fun-Casino has offered several hit games across genres like slots, video poker, and more. It helps that it offers games from top developers like Betsoft, Endorphina, Ezugi, Pocket Dice and SoftSwiss. Though it initially functioned as a Bitcoin casino, the site has progressed to become something more. Nowadays, Fun-Casino has become a decentralized gambling platform for various cryptocurrencies. Already accepting the top cryptocoins out there, the casino has decided to start offering its own cryptocurrency. FUNC is an MIT-licensed, Graphene blockchain technology-based token that the site has begun to use, both as tokens for play and for allowing people to invest in the site. Fun-Casino has created 100 million FUNC tokens for use on the site. These tokens work both as tokens for wagers and also as part-investment into the site. All of the owners of these tokens automatically become stakeholders of Fun-Casino. As shareholders, they will be eligible for a portion of Fun Casino’s income as dividends. Those who have tokens will be receiving the weekly dividends every Friday. However, for people to receive these funds, the FUNC tokens need to be deposited into their respective Fun Casino wallets. All deposited FUNC tokens kept in a Fun-Casino wallet will be part of the sharing of 50 percent of the revenues of the Fun-Casino platform. Profits are calculated via a simple process. Total revenue is first divided in half. One half is to cover costs, while the other is for FUNC dividends. The dividends are divided by how big a person’s share is. For example, a FUNC holder has 10 percent of the total FUNC being kept in wallets. This means they get 10 percent of the week’s dividends. Besides being used in the dividend program, FUNC can also be traded just like other crypto tokens. People can sell them for Bitcoin or any other cryptocurrency. However, this trading feature is available only on the OpenLedger platform. Right now, the only way to get the tokens is to participate in the FUNC crowd sale that started last Sept. 6, 2016. This is will continue until Nov. 1, 2016. OpenLedger will keep on selling FUNC tokens, with 10-percent additional coins to those who are investing. 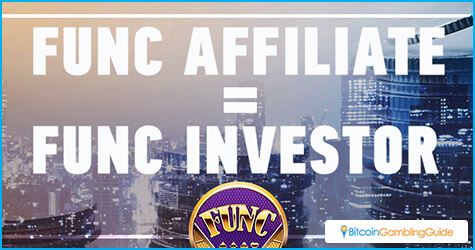 At present, an investment of 1 BTC will get 11,000 FUNC tokens. Buyers can choose between Bitcoin, Bitshares, and Ethereum as their cryptocurrency of choice. Players can also earn FUNC in two other ways. 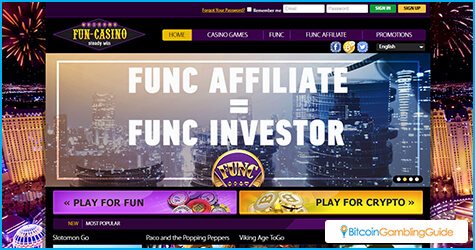 FUNC tokens are allowed to be used as betting tokens at Fun-Casino. If gamblers choose to bet using this denomination, they have a chance of winning more. However, they can also lose them. Interested buyers can also buy them on the OpenLedger platform from investors who want to sell their FUNC tokens. With FUNC becoming active, Fun-Casino will become an interesting place to gamble and will offer something other Bitcoin casinos do not.